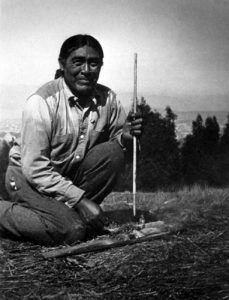 Ishi (Yana for Man) was known as the “last wild Indian”. Yahi – Meaning “person” in their own language, the Yahi constituted the southernmost group of the Yana division of the Hokan linguistic stock. They were hunter-gatherers who lived in small egalitarian bands without centralized political authority. Primarily living on Mill and Deer Creeks in northern California, they were reclusive, and when white settlers began to invade their lands, were fierce in defending their diminishing territory of mountain canyons. The last known survivor of the Yana people was from the Yahi tribe. He emerged from the mountains near Oroville, California on August 29, 1911 after the last of his family died. Having lived his entire life hiding with his tribe in the Sierra wilderness, he had never been exposed to European-American culture. Though he refused to speak his name, due to traditional customs, he was dubbed “Ishi,” the Yana word for “man.” Known as the “last wild Indian,” he was taken to the University of California, Berkeley for study and protection, where he lived nearby until he died of tuberculosis in 1916. During the “study, his language was recorded. Yahooskin – Also referred to as Yahuskin, they were Shoshonean band which prior to 1864 roved and hunted with the Walpapi about the shores of Goose, Silver, Warner, and Harney Lakes in Oregon. On October 14, 1864 they made a treaty with the U.S. Government ceding their lands and being placed on the Klamath Reservation, established at that time. With the Walpapi and a few Paiute who had joined them, the Yahooskin were assigned lands in the southern part of the reservation, where they were engaged in agriculture, lived in willow lodges and log houses, and gradually abandoned their roaming proclivities. At the turn of the century they were reported to have had a little more than 100 members. Unfortunately, for those living on the Klamath Reservation in Oregon, including the Modoc, Klamath and Yahooskin tribes, an act of congress terminated federal recognition in 1954 and took away some 1.8 million acres of their reservation. In 1986, the Klamath Indian Tribe Restoration Act returned their federal recognition, but did not return their land. Today, they are scattered primarily in Klamath County, Oregon. Yakonan Family – The Yakonan were a linguistic family formerly occupying territory in western Oregon, on and adjacent to the coast from the Yaquina River south to the Umpqua River. Composed of four tribes, including the Yaquina, Alsea, Siuslaw, and Kuitsh, they were notable for the practice of artificial deformation of the head. The Yakonan mythology and traditions were much like the tribes of the Washington Coast, but they showed traces of modification by contact with the California tribes to the south. Though there was no totemic clan system, they tended to segregate in groups related by blood. There was a preference for marriage outside the tribe, though this rule was not strictly enforced. Slavery was an institution in full force until the tribes came under the control of the United States. On the formation of the Siletz Reservation in Oregon in 1855, they were removed there and their numbers began to decline rapidly through the ravages of tuberculosis and extensive intermarriage with other tribal members. by the early 1900s, no census was able to be taken of specific members. Yamasee – A former noted tribe of Muskogean Family, they were best known in connection with early South Carolina history, but apparently, originally occupied the coast region and islands of southern Georgia and extending into Florida. Due to their location near the Savannah River, they were frequently confused with the Shawnee and and Yuchi tribes. Missions were established in their territory by the Spaniards about 1570, and they lived under the jurisdiction of the Spanish government of Florida until 1687. At that time, an attempt was made by the Spaniards to transport a number of their people as laborers to the West Indies and, naturally, they revolted, attacking a number of the mission settlements and peaceful Indian tribes, before fleeing north across Savannah River to the English colony of South Carolina. They were allowed to settle there, in what is present-day he Beaufort County, where they would eventually establish several villages. They aided in the fight against the Tuscarora tribe in 1712, but in 1715, when they became dissatisfied with the the traders, organized with other tribes, including nearly all of the tribes from Cape Fear to the Florida border, to fight against the English. Numerous traders traders were slaughtered and a general massacre of settlers took place along the Carolina frontier. After several engagements, the Yamasee were finally defeated by Governor Craven at Salkechuh on the Combahee River and driven across the Savannah River. They retired to Florida where they were again received by the Spaniards and settled in villages near St Augustine. From that time, they were known as allies of the Spaniards and enemies of the English, against whom they made frequent raids with other Florida tribes. In 1727, their village near St Augustine was attacked and destroyed by the English, and their Indian allies and most of the inhabitants were killed. 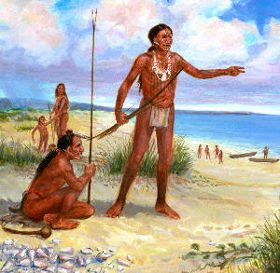 In 1761, what was left of the Yamasee numbered only about 20 men, in camps near St Augustine and Pensacola. Later, the tribe was virtually destroyed by the Seminole tribe and those that survived were enslaved. As late as 1812 a small band retained the name among the Seminole, and some settled among the Hitchiti, but by the turn of the century, they had completely disappeared. Yamel – A Kalapooian tribe formerly living on Yamhill Creek, a west tributary of the Willamette River in Oregon. By 1910 they only numbered five. Any descendants of the Yamel today are part of the Confederated Tribes of the Grand Ronde Community of Oregon. Yampa – A division of Ute Indians, the Yampa lived in east Utah on and about Green and Grand Rivers. By 1849, they occupied 500 lodges. Bands of the Yampa included the Akanaquint arid Grand River Ute. They were eventually merged with the White River Ute. Yana – Having their own distinctive language, the Yana formerly occupied the territory from the Round Mountains near the Pit River in Shasta County, to Deer Creek in Tehama County, California. The west boundary was about 10 miles east of Sacramento River, both banks of which were held by the Wintun tribe, with whom the Yana were frequently at war. They lived by hunting wild game, fishing for salmon, and collecting fruit, acorns and roots. Unfortunately, for the Yana, when gold was discovered in the area during the California Gold Rush, prospectors, ranchers, and businessmen flocked to their territory. Because their food supply began to diminish, they suffered great losses and fought with the intruders. As a result, in 1865, the miners organized a large group and attacked the Yana camp, killing all but about 30 people. What was left of the tribe retreated into the mountain wilderness and by 1902, there were only about six of them remaining.